AquaLink View PLB from ACR relays your position to a worldwide network of Search and Rescue satellites in the event of an emergency. 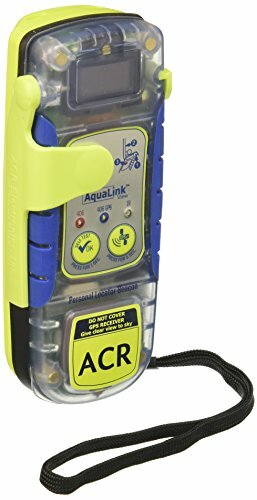 AquaLink's digital display allows you to test the device as well as check on your co-ordinates and battery power. AquaLink features three levels of signal technology - GPS positioning, 406MHz signal and 121.5 MHz homing capability. These technologies work together to relay co-ordinates accurate to within 100 metres to worldwide emergency services. An LED strobe light helps you attract attention once rescue services arrive. Unlike many other PLBs, the AquaLink features a digital display - this gives you peace of mind as it allows you to check on battery life and view your GPS latitude and longitude. It also makes testing the device much easier as on screen instructions guide you through the process - testing PLBs without a screen means relying on a series of beeps. Should you wish to register your device in the US, please choose our ‘Programmed for US Registration’ listing. For registration outside the US please choose our ‘Programmed for Rest of World’ listing and advise us of your required country of registration after purchase so we can program the device for you. Please note that some countries, such as Spain and Germany, do not allow PLB registration unless registered to a vessel. Users in these countries without a vessel can register their devices in the US if required.